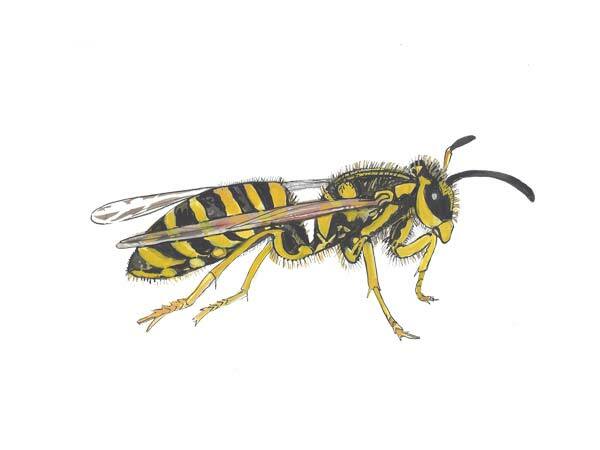 Yellow jackets are commonly mistaken for bees because both are similar in color and size. Yellow jackets are around 10-12mm in length. Their color alternates between black and yellow bands around their abdomen and thorax. Their faces also alternate between yellow and black. Yellow jackets can create either an aerial nest or conceal them under the earth. When introduced into urban settings, yellow jackets create nests in voids of walls, ceiling corners and under roof eaves. The yellow jacket nest usually lasts about one season before they begin to die off. In the beginning the queen builds the nest, which averages the size of an orange. Yellow jackets prefer tree sap, fruits, nectars and flowers. Insects are collected by adult yellow jackets to feed their offspring or larva. Yellow jackets are considered a beneficial insect because they commonly eat pests that destroy crops. Yellow jackets are social creatures living in highly organized colonies made up of queens, workers and drones. Each Spring fertilized queens emerge from hidden areas to build nests and lay eggs. As the eggs hatch, new offspring emerge with specific duties such as tending to young, searching for food or defending the nest. Colonies started in the Spring by a single female average between 1,500-15,000 individuals. *Warning – Yellow jackets can inflict severe pain from stings and in some cases cause allergic reactions. Contact a licensed pest control technician for yellow jacket eradication services. Yellow jackets play an important role in destroying insects that attack crops and agriculture. They eat crop destroying pests and act as pollinators for plants. Yellow jackets should only be eradicated if they pose a threat to humans. Yellow jacket nests are complex and are sometimes hidden under the earth. The first step for yellow jacket control is a detailed inspection from a licensed pest control technician. Only once the nest is located and the species is identified can treatment begin. Treatments vary between insecticides, baits and traps. Keep garbage in bins sealed with lids, rinse out sugary beverages before discarding and remove all outside food sources. Yellow jackets are attracted to sugar: pick fruits as they ripen and discard of any rotten fruit accumulating on the ground. Yellow jackets aggressively defend their nest against predators when disturbed. Their defensive behavior increases as the Winter months approach and food sources grows scarcer. Aggressive behavior also increases as the colony grows in size; therefore it is best to address infestations before they become too large. Yellow jackets are notorious for multiple stings when aggravated. Their stingers have no barbs and can be used many times to inflict pain. Reactions to yellow jacket stings can be short lived to life threatening. Typical reactions include swelling, tenderness, itching and intense burning sensations. Multiple stings are the most damaging for the liver and can lead to serious medical conditions or death. We are skilled at getting rid of yellow jackets. We proudly serve Sarasota yellow jacket control, Bradenton yellow jacket control and surrounding neighborhoods.